Deep in the landlocked heart of the Midwest, the characters in The Spoils are drowning under the weight of masculinity, paralyzed in the grip of things left unsaid. These men are broken and breaking, struggling to reckon with the decisions they’ve made and those they have yet to face. Set mostly in and around Kansas, the stories in this powerful collection explore how men perform, in their jobs and personal lives, and investigate the gray area between doing what’s best for oneself and acting a part to make others happy. A man questions whether he should leave his drug-addicted girlfriend and her son or stay, sacrificing his own well-being to be the boy’s father. Fed up with the role of the stooge, a Washington Generals player takes his A-game to the Harlem Globetrotters and has to face the unforeseen consequences. A rookie prison guard sent to procure a death row inmate’s final meal commits a small, subversive act of humanity. In a world where the line between right and wrong is constantly shifting, some struggle to do the right thing, while others eschew the line altogether and deal with the sometimes violent repercussions. The Spoils examines these difficult choices and will appeal to readers of literary fiction and short stories, especially readers of fiction based in the Midwest. "While many of the conflicts contained in this collection are heavy, the book is light and highly readable thanks to Pycior’s ability to convey lived-in stories with Heartland humanity." "Pycior reminds us with insight and empathy that while we are all broken in different ways, we are all broken." 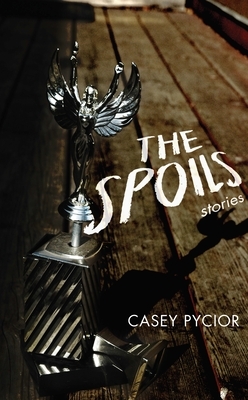 “Casey Pycior’s engaging new story collection, The Spoils, will make you want to ‘come with,’ as we say in the Midwest. From an itinerant worker who only thinks the worst of his recent luck will be losing a finger to a basketball player poised to take down an institution, Pycior’s vibrant characters veer in unexpected, exciting directions. His stories are tenderly Midwestern—steeped in funny, idiosyncratic syncopations of dialogue and form—but never simple. These folks lead nuanced lives among the familiar landmarks of local gas stations and Hy-Vee stores and the historic tragedies of their towns. They’re often haunted by their children, but always seeking the courage to do the right thing by them and the waiting world. You should do the right thing, too, and read this impressive debut. Pycior’s a writer bound to stay on the Doppler." “Casey Pycior’s collection The Spoils contains an achingly observed collection of characters, scrabbling for their dreams on the edges of the Great Plains. These strivers often leave blood and treachery in their wake, but Pycior’s strength is the intricate craftsmanship he employs to illuminate each soul. Think Tobias Wolff in Wichita, or William Trevor in Kansas City—but above all, read this book and discover its remarkable pleasures for yourself. I did, and I think The Spoils announces a thrilling new voice in American fiction.